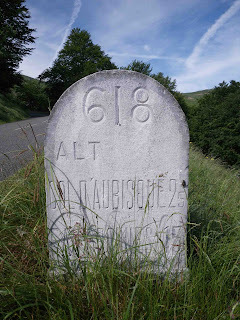 SimonWillis.net: Argeles-Gazost - Col d'Aubisque & Col du Soulor. Video. Argeles-Gazost - Col d'Aubisque & Col du Soulor. Video. Finally, we reach one of the classic climbs of the Tour de France... and it turns out to be two climbs, of two Cols, each 10km apart. As I say below, between the Cols was some of the best riding anywhere. But the first quyestion is where to stay. The two big campsites in Argeles Gazost were not our kind of place - we felt they were too noisy, crowded with small pitches. So initially we drove to Camping Pyrenees Natura well outside of the town. Secluded, nice bar/bistro and slightly expensive. However, I felt it was too far from the base of the climbs I wanted to ride, although I subsequently met a rider from here who felt it was fine. We found another quiet campsite much nearer Argeles Gazost called Soleil Pibeste campsite at Agos-Vidalos and this is where we rode from over the next few days. As it turns out, there are loads of campsites in the valley and on the D 918 up to the Cols, but Google doesn't seem to find them. Agos-Vidalos is a good base because; it's far enough out of town to avoid most of the traffic, which now uses the dual carriageway bypass; it's an easy flat ride into Argeles Gazost; there's a back road and a cyclepath up and down the valley. In one direction this cyclepath goes all the way into Lourdes, a city we visited as a recovery ride. Oh, and in late June, we had no problems getting a place on any campsite. OK - riding the Aubisque. The hardest part of this climb seems to come right at the start. Getting out of Argeles-Gazost is a slog up a steep, busy road. 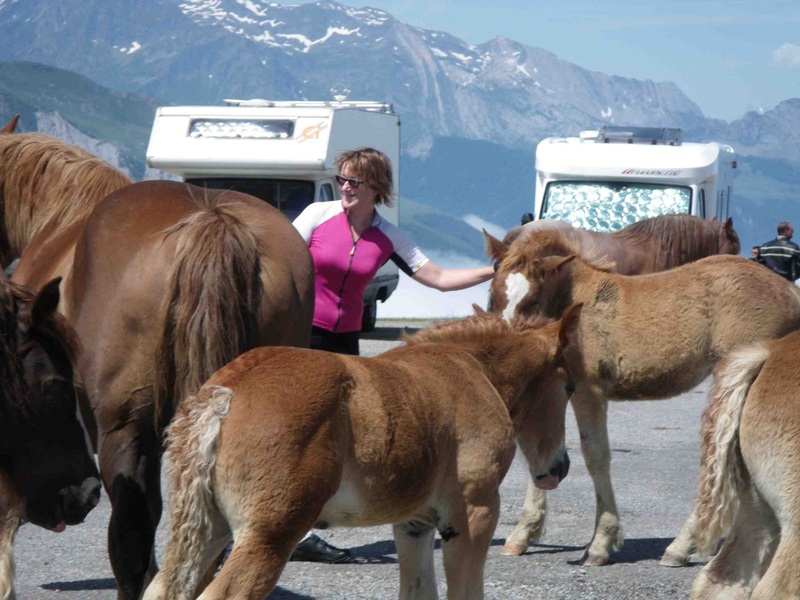 An early start is essential to avoid the campervan and other tourist traffic. We left at 8am, no riders passed us, yet loads of even earlier starters came down before we reached the top. Surprising as it may seem, this climb felt much, much easier than our earlier routes. They were short and steep, whereas this climb is spread over 30km. On a 10-11% gradient I'm mashing the pedals in granny gear with no attempt to spin, but I spent a lot of this climb in second gear. 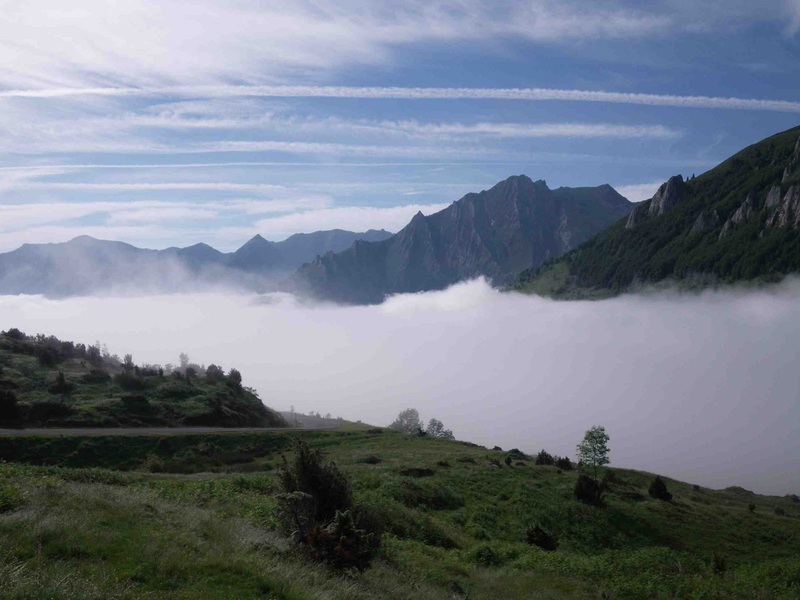 The route comes alive at Arrens-Marsous, two lovely conjoined mountain villages. 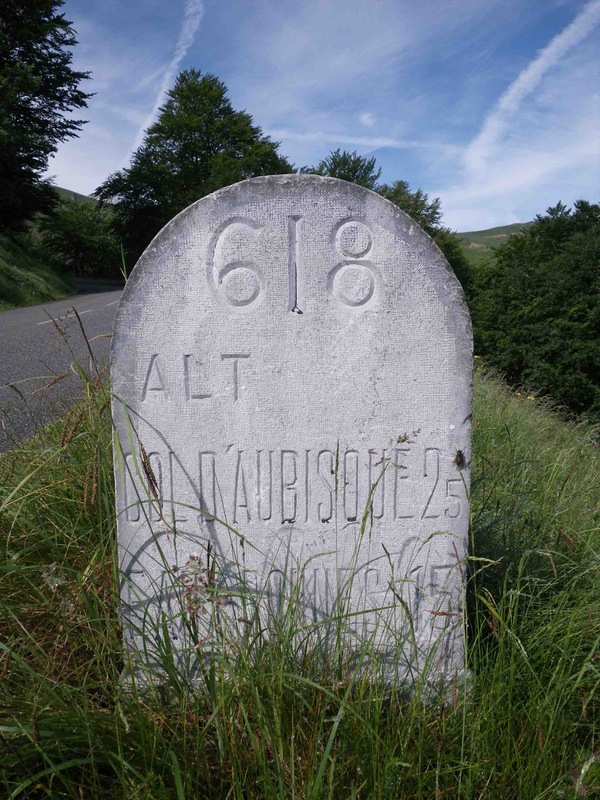 The 7km countdown markers to the Col du Soulor appear, along with the inevitable hairpin bends. 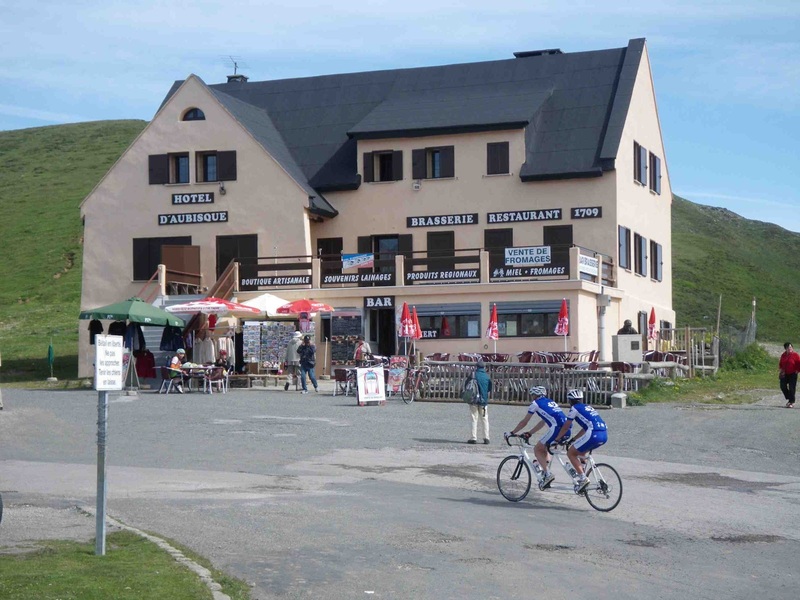 Soon enough though the top is in sight with a series of cafes and ski infrastructure. 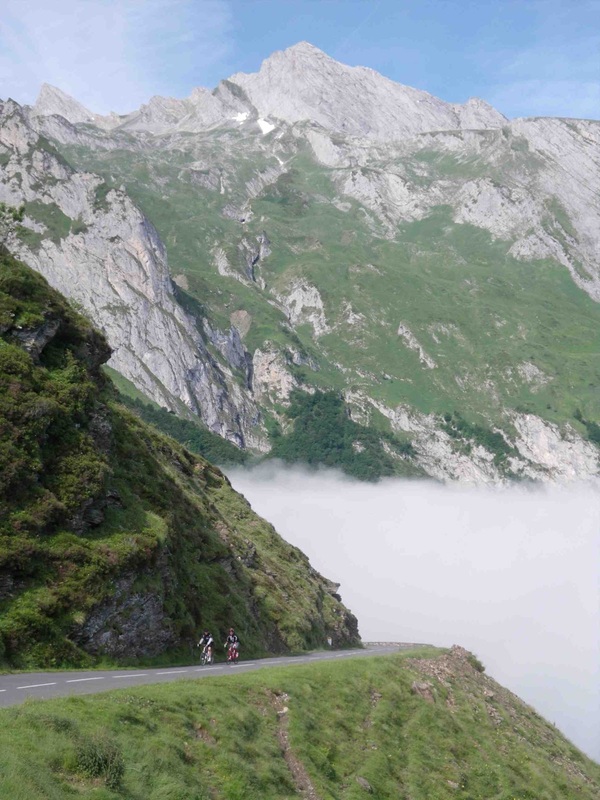 The Col d'Aubisque is 10km and 235m of height gain away, and between the cols is some of the most spectacular riding anywhere in the world. A 2.5km downhill is a pain (especially coming back!) but the route is fairly flat after that, rarely climbing at more than 6% and often nearer 4%. 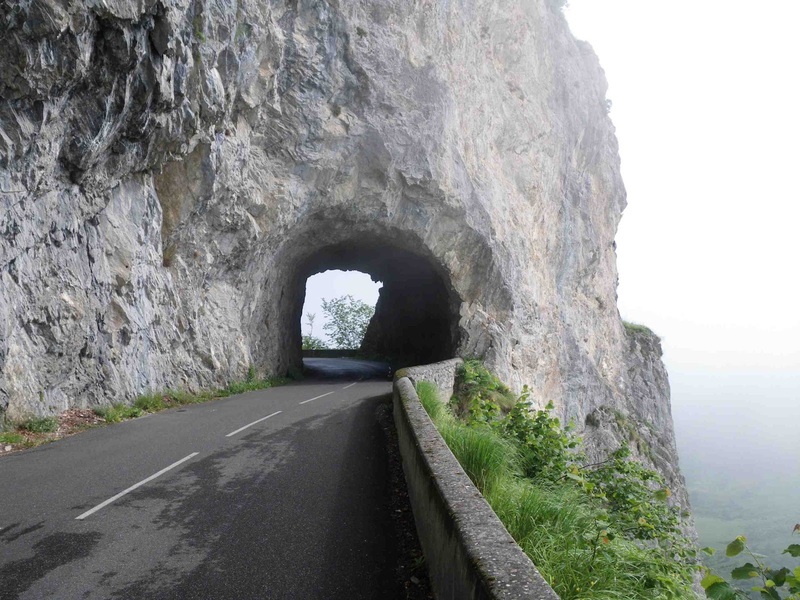 There's an impressive rock arch to ride through and a short stretch of tunnel in which care is needed as the surface is rough and wet. 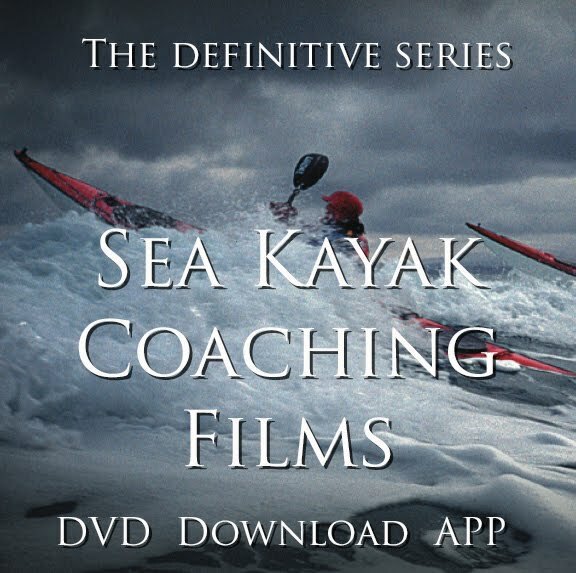 Finally, a short steeper haul to the summit and you're done. This summit is a busy, busy place. There are two cafes (or is it three?) and lots of tourist coaches. I was trying to snap my own photo on the summit, when I was approached by some Japanese tourists who wanted their photos taken... with me! I think they confused me with someone else, someone younger, lighter and altogether a much better bike rider perhaps? Certainly the (many) other French cyclists milling around the car park watched this impromptu photography session wearing expressions which mixed confusion, disbelief and barely disguised hilarity. All the things you've seen on the helicopter shots from the Tour de France are there - except the huge crowds. 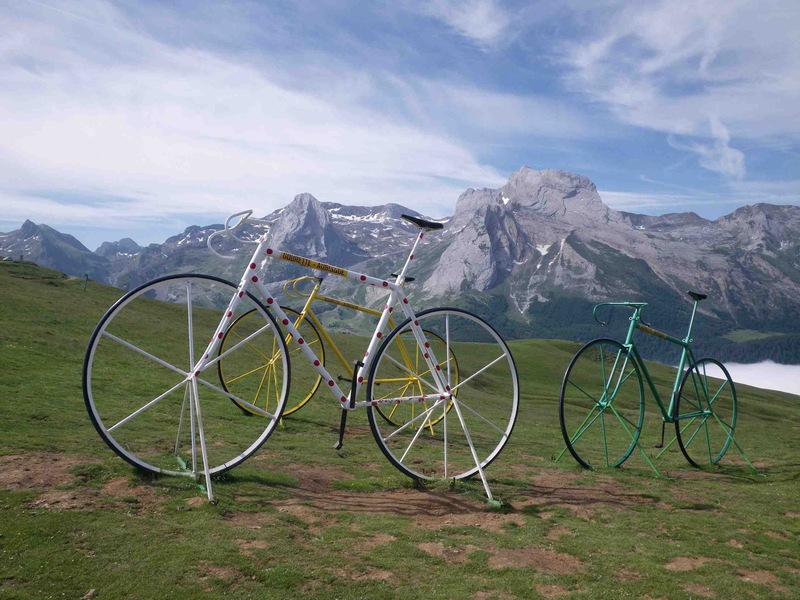 Most noticeable are the three giant bikes decorated in the colours of the three main TdF competitions. 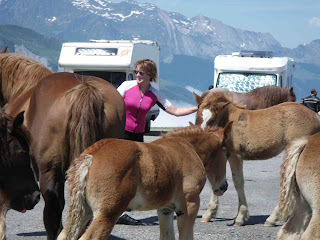 What you might not have seen before is the herd of horses, which seem to be semi-wild. All traffic over the Col came to a complete standstill as they made their way from the pasture into the car park. They look lovely, until they start scratching themselves on your wing mirror. Those matted coats can leave marks on a metallic paint finish like skates on ice. We watched as they wandered, unhindered but well photographer, around the large summit car park. They enjoyed the attention and enjoyed the treats from tourists even more. If you whizz straight back to Argeles, then the 'official' route is 60km with 1380m ascent. That is according to the topo guides which you buy for €5 from the Tourist Information. These state that a 'regular rider' (a 'Confirme') could do the round trip in 2:10-3:00 hours. If, when you get back to the Col du Soulor, you're still feeling fit, turn left and return to the valley via the Col de Spandelles (1378m). 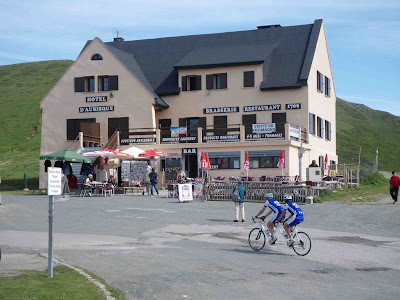 I rode up to the Aubisque in 2:20 but we stopped for pizza on the way down. Which is a story in itself. Eating out in France is difficult if you don't eat meat. We thought we'd be safe with a goats cheese salad, but I struggled to translate part of its description on the menu. A neighbouring diner came to my assistance, "it is with a gizzard of some kind" he said. Ahh. Pizza it is then. The vultures would have loved it. A dead lamb I'd noticed lying beside the road going up the Col du Soulor had, by the time I returned, become lunch for a huge flock of different raptors. It was a genuine feeding frenzy, but initially I was too far away to capture the scene on my wee compact camera. Later I rode lower to catch the aftermath of the pushing, squabbling and gorging.